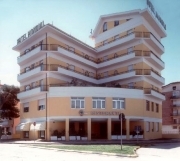 Hotel Mondial is located in Porto Recanati is located in central location, only 100 mt. from the sea and near a large public park. It’s only a few km. away from Monte Conero with the wonderful scenery of the sea and the most beautiful sights of Italy: Loreto, Recanati, Grotte Frasassi, Ascoli Piceno, etc. The family-run hotel has been recently renovated and has 42 rooms all with every comfort: bathroom, airdryer, safe, minibar, telephone, SKY, air conditioning, balcony and free wi-fi. The rooms have different settings and colors. This allows to satisfy every request. The restaurant offers regional cusine and various sea food specialities. Large private parcking and garage. Two restaurant rooms and a breakfast room. Free Private beach for our guest and bicycle for rent. Reception open 24h and room service. Free wi-fi in all the Hotel. Porto Recanati is reachable by the National road SS.16 or by the highway A14, exit of Loreto-Porto Recanati.